One of the areas in which Mattel’s Masters of the Universe Classics line is really succeeding is oversized figures. The fact that Mattel was able to sell 2011 Club Eternia Subscriptions with these items included is a testament to how much they add to the MOTUC line. The latest of these items to grace my shelves is the Masters of the Universe Shadowbeast. Another thing that Mattel is getting a good deal of mileage out of is apes. 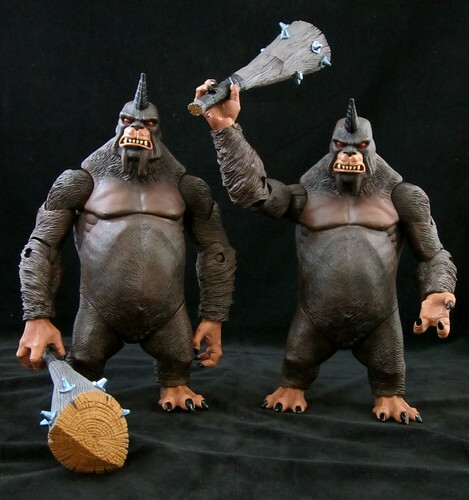 We’ve had Gorilla Grodd and Ultra-Humanite in the DC Universe Classics line and Gygor in MOTUC. The Shadowbeast is a very welcome addition to Mattel’s simian symposium. While the Shadowbeasts share elements with Gygor, this feels like a completely original piece thanks to its very nicely crafted original parts. The headsculpt on these monkeys is fabulously menacing and this, making them great for setting up in threatening positions over your Eternian heroes. The bared teeth and wild eyes are assisted by that whacky Shadowbeast arm to create a very angry ape! All of this great sculpting is very handsomely complemented by an excellent paint job. The torso has some very nice shading, with the lighter sections on the Shadowbeast’s pecs and ribs creating a real look of muscle, assisting in making the whole piece look more lifelike. The lighter tone chosen for the hands and feet is a great choice as it highlights the visible tendons that lead to dark, sharp looking claws. All of this combines to create a very classic giant baddy for the MOTUC line! There is more than adequate articulation present for a figure of this size and body shape. The rotating ankles are particularly important for posing as they have a tendency to topple over when in poses with raised arms unless they are correctly positioned. The Shadowbeasts come with the most awesome of accessories, which is a spiked wooden club that is truly massive. I am not a mad keen accessory person, but these clubs will most definitely be on display at my place! The only issue with the clubs is that they are quite heavy and limit posing, but they are worth it as they are so impressive. Obviously I’m very happy with this figure - and very glad I took the plunge and bought a second, as they really are perfect for army building! As I write this, I’m expecting my Panthor any day now, so I am looking forward to more MOTUC beastly goodness soon! As far as I’m concerned, Mattel can keep pumping these goodies out for a long time to come! These are pretty cool figures i might have see about getting one someday. 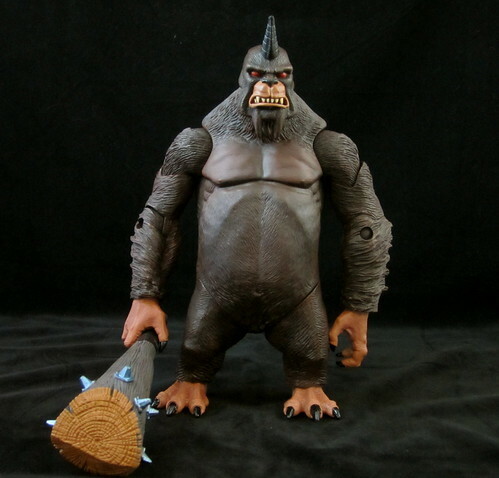 As a fan of the Gorilla Grodd CNC figure, I really want a few of these. I really love how Mattel's worked up quite a library of figures and is able to re-work an old toy like this into something that still stands out..